The passenger compartment remained stable in the frontal impact. Dummy readings indicated good protection of the knees and femurs of the front seat occupants. However, structures in the dashboard posed a risk of injury to occupants of different sizes and to those sat in different positions and protection for the knee/femur/pelvis body region was rated as marginal. Maximum points were scored in the side impact barrier test, all parts of the body being well protected. In the more severe side pole impact, rib deflections in the dummy indicated weak protection of the chest. The seat and head restraint are slightly changed from the car tested in 2010. Tests were repeated and, again, the results indicated marginal protection against whiplash injuries in the event of a rear end collision. In the frontal impact, movement of the head of the 3 year dummy, sat in a forward facing restraint, was not excessive. In the side impact, both dummies were properly contained within the protective shells of their restraints. The front passenger airbag cannot be disabled to allow a rearward facing child restraint to be used in that seating position. The labels warning of the dangers of using a rearward facing restraint in that seating position were not sufficiently clear. Jaguar have investigated the reasons why the child restraints did not have permanent labels when the car was tested in 2010 and have ensured that dealers can now supply units with permanently attached instructions and information. The XF is equipped with an active bonnet. When sensors in the bumper detect that a pedestrian has been struck, an airbag system lifts the bonnet away from hard structures in the engine bay. This additional space offers better protection to a pedestrian's head. When the car was tested in 2010, the system was not as sensitive as Euro NCAP required. Jaguar have made improvements to the system and demonstrated to Euro NCAP that the car now triggers when the car impacts a broad range of pedestrian statures, and over a wide range of speeds. Accordingly, the tests were repeated with the system active. The results are noticeably better, especially in the area of the bonnet likely to be struck by a child's head. Most of the tests in that area indicated good head protection. In the areas likely to be struck by an adult's head, protection was predominantly poor but was good in some areas. As last time, the bumper offered good protection and scored maximum points but the front edge of the bonnet was poor and scored nothing. 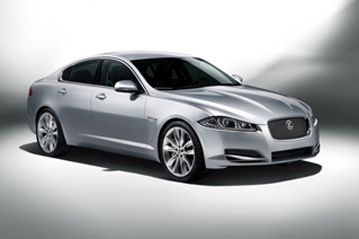 The XF has been facelifted for the 2012 model year, sales of which started in the autumn of 2011. Structurally and internally, the new car is identical to the one tested in 2010 and test results for the frontal, side barrier and side pole impacts have been carried over from that assessment. New pedestrian tests have been carried out as there are slight modifications to the bodywork at the front of the vehicle and because Jaguar have improved their active bonnet sensing system. ESC tests have also been done to complete this 2011 assessment for the car.